Operate the Plant at the following generating capacities to compute the isentropic change in enthalpy and thermal efficiency for the HP turbine. Recall from the First and Second Law of Thermodynamics that the adiabatic process where entropy remains constant provides the maximum energy for work. As shown on the H-S coordinates, the difference in enthalpy, (H1-H2), is maximum when the lowest enthalpy (H2) is reached at the exit conditions. The ideal expansion is, therefore, a vertical line. On the diagram above, T1, P1 and P2 are known process variables, for example, H1 is determined by using T1 and P1. H2 then can be found drawing a vertical line from P1 to P2 by following adiabatic isentropic expansion (expansion at constant entropy). The difference in enthalpy H2’-H2 is called the reheat factor and is the basis for multi-stage turbines. As can be seen on the Mollier diagram, the pressure curves are divergent. 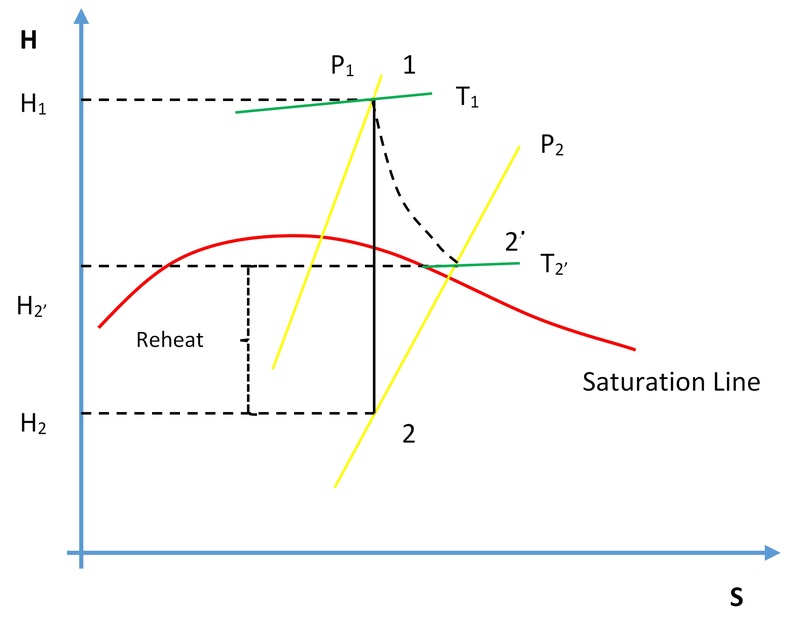 This means that the higher the pressure drop in a single stage turbine the greater the reheat factor and in turn the lower the turbine efficiency. However, if the steam is expanded through multiple stages and between each stage the steam is reheated, higher turbine efficiencies can be achieved. We will see this effect later in the Power Plant Efficiency lab. For each condition collect the relevant data to compute the isentropic change in enthalpy for the HP turbine. Compare your results, which of the three conditions yield the most favourable results and why? Conclusion: Write a summary (max. 500 words, in a text box if using Excel) comparing your results and suggestions for further study. Thermodynamics and Heat Power by I. Granet: Vapor power cycles. Turbine Efficiency by Serhat Beyenir & Sanja Boskovic is licensed under a Creative Commons Attribution 4.0 International License, except where otherwise noted.